Sampathi, S., Wankar, J., Dodoala, S., Mankala, S. (2013). Formulation and Evaluation of Hydrogel-Thickened Microemulsion For Topical Delivery of Minoxidil. Iranian Journal of Pharmaceutical Sciences, 9(4), 1-14. Sunitha Sampathi; Jitendra Wankar; Sujatha Dodoala; Santhosh Kumar Mankala. "Formulation and Evaluation of Hydrogel-Thickened Microemulsion For Topical Delivery of Minoxidil". 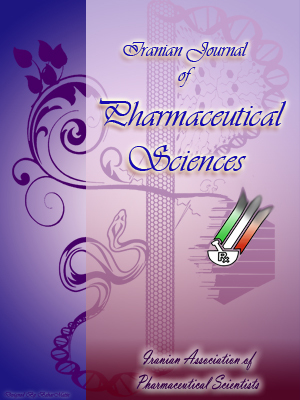 Iranian Journal of Pharmaceutical Sciences, 9, 4, 2013, 1-14. Sampathi, S., Wankar, J., Dodoala, S., Mankala, S. (2013). 'Formulation and Evaluation of Hydrogel-Thickened Microemulsion For Topical Delivery of Minoxidil', Iranian Journal of Pharmaceutical Sciences, 9(4), pp. 1-14. Sampathi, S., Wankar, J., Dodoala, S., Mankala, S. Formulation and Evaluation of Hydrogel-Thickened Microemulsion For Topical Delivery of Minoxidil. Iranian Journal of Pharmaceutical Sciences, 2013; 9(4): 1-14. The available minoxidil formulations for topical application suffer with major drawback and requires repeated application. The present study was aimed to investigate the effect of microemulsions and microemulsion based hydrogel-systems (MEHs) for increased percutaneous penetration of minoxidil. Minoxidil microemulsions were developed by conventional titration method using oleic-acid as oil, tween-80 as surfactant and PEG 200 as co-surfactant, whose compositions were optimized using pseudo-ternary phase diagram. The drug and polymer interactions were investigated by FTIR. Prepared microemulsions and MEHs were evaluated for drug content, viscosity, pH, in-vitro, ex-vivo permeation, skin irritation and stability studies. The drug content and viscosity of microemulsions was found ranged from 56.77±2.88-92.85±1.59 %, and 89.12±1.801-144.24±0.95cps respectively. In-vitro skin permeation from these microemulsions was sustained over 24h with drug release around 32±3.26-99±3.78 % with more retardation in F4 (oleic-acid:Smix:water 58%:40%:2%). F4 was incorporated into hydroxypropyl cellulose gel to get MEH formulation and both were compared with the marketed topical solution. Marketed preparation was diffused at faster rate in comparison to the microemulsion and MEH. The drug release order was found to be Higuchi’s with non-Fickian “anomalous” mechanism at controlled rate. The flux of the F4 and MEH was found around 70.11±10.81 and 90.26±11.46 (μg/cm2/hr) with permeation coefficient around 27.18±6.69 and 30.21±5.16 (cm/hr). The microemulsion did not show any dermatological reactions when tested. The microemulsion was found stable on storage and results suggested that microemulsions and MEHs could be more promising for topical delivery of minoxidil in hair loss treatment as compared to solution based formulations.